Once tapped, cask beer only has a few days to be consumed in its prime state of freshness. We call these days, Cask Days. 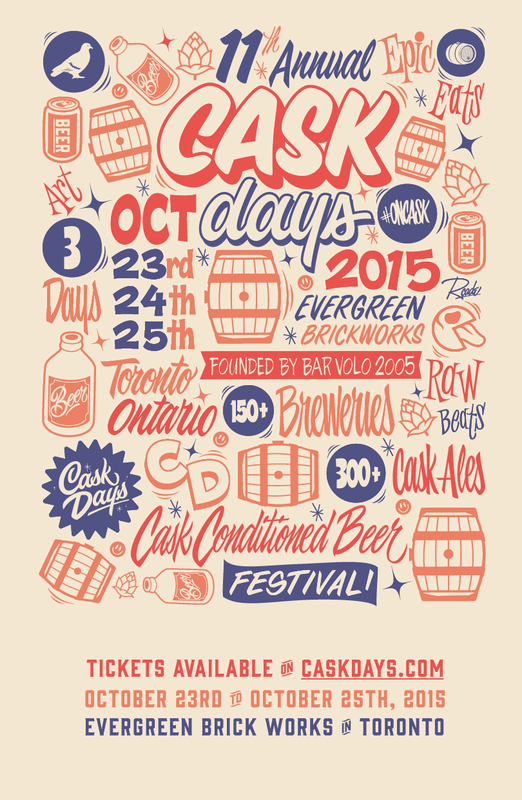 Cask Days welcomes back over 100 breweries from across Canada, United Kingdom and the United States (California & New York State). This year, the state of Washington has been chosen to be the 2015 brewery feature presented in conjunction with Elliot Bay Brewing of Seattle. There will be a variety of 30 beers available from Washington State that have never been served in Ontario before. Alongside an exceptional line up of beers, Cask Days brings Toronto’s most coveted restaurants and chefs including: Brando’s Fried Chicken, WVRST Beer Hall, Porchetta & Co., 416 Snackbar and Bar Volo. Other unique programming includes: The 7th Annual IPA Challenge, works by featured artist Andrew Kidder (RCADE Wizard) and local DJ’s Box Of Kittens.